Millennials are the hot topic in today’s advertising world. After surpassing Baby Boomers as the “largest generation,” brands are desperate to attract them. But bigger isn’t always better. Baby Boomers still hold the greatest purchasing power with more than twice the median income of Millennials. It‘s projected that Americans over 50 will increase their spending by 58% over the next two decades, compared to only 24% for Millennials. Between the competitive job market, skyrocketing rent, or never-ending student loans, many Millennials don’t have the disposable income those 50 to 70 years old have from years of saving and investing. With younger generations shifting their attention towards streaming content from sources like Hulu and Netflix, Baby Boomers will remain the more accessible generation for advertisers to target on traditional TV. Between 2011 and 2016, almost 40% of Millennials’ traditional TV viewing time migrated to other activities or streaming. On top of that, they make up 43% of the “cordless” population. Even if that weren’t the case, Baby Boomers still spend almost twice as much time watching TV as younger audiences, or over twice as much for those 65 and up. In the matter of digital, younger generations’ greater acceptance and usage of ad blockers remains a huge threat for advertisers. Baby Boomers show less interest in the technology with only 13.9% of their population using ad blockers, versus 41.1% of Millennials. Baby Boomers didn’t grow up fast forwarding through commercial breaks so their attitudes towards advertising are less adverse than the younger viewers who did. So what’s the recipe for creative success among Boomers? We uncovered five key insights to help advertisers better reach the Boomer generation by identifying ads from the past year that resonated significantly more with this group compared to Millennials. We analyzed the top and bottom 20 ads across all categories according to viewers, aged 50+. There is more than one way for an ad to engage this generation, whether it’s through emotional storytelling or rational, informative ads. As depicted in the chart below, Relevance, Desire, and Likeability were the three components that best determined an ad’s success among Boomers. Most of the ads analyzed were not specifically targeting Baby Boomers, but based on their reactions brands can learn various ways to effectively resonate with them. ‘Heartwarming’ messages dominated the Top 20 Ads. With a third of U.S. Millennials still living at home, Baby Boomers find ads with concepts of family, love, and togetherness highly Relatable and Likeable, as represented by the large gap-to-norm for these components across the top ads. Heartwarming messages, with an emphasis on the importance of family, create Desire among this group by generating strong positive brand perceptions that are based on emotions and experiences relevant to their lives. Holiday themes, which often emphasize family and love, are found in seven of the top 20 ads. As the flood of heartwarming messages clears out after the holidays, advertisers can standout and strengthen positive brand perceptions among Baby Boomers by incorporating concepts from holiday-themed ads throughout the year. Coldwell Banker warmed hearts with its ad “Somebody to Love,” which highlights the impact pets have on making a house a home. Scoring significantly above industry-norms for every metric we measure, the Message was named the Single Best Thing about the ad by 34% of Baby Boomer respondents. 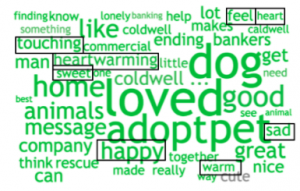 The word cloud below shows Baby Boomers’ responses had all-around positive sentiment towards the ad, with 28% of them using emotional words related to ‘heart.’ Many of them noted they loved the touching message about pets as part of the family, and thought it made Coldwell Banker more of a caring company. While emotion is one tactic toward driving Boomer appeal, at the other end of the spectrum this audience appreciates direct and clear product information. Many of the top ads we analyzed created Desire for a product among this demographic by clearly communicating detailed Information. Baby Boomers were most engaged with ads that described the quality of the product or a relatable problem it could solve. Emphasizing quality drives Desire among Baby Boomers by adding credibility and value to the product. Other ads in the top 20 emphasized product convenience, provided statistics on a product’s successes, relayed information about sales or offered discounts. Baby Boomers appreciate value in a product or brand. For value brands, offering a deal, like the $5 Footlong at Subway, or a discount are ways to get the ‘more-for-less’ value message across to these viewers. Premium brands can inform Boomers of their value by communicating their brand equity. What makes them worth more than their value-brand competitors? Either way, don’t leave Baby Boomers guessing. Explain value in a direct and unambiguous way when targeting this age group. In the ad above, Samsung drove desire for its SUHD TV with attention-grabbing visuals that validated the information stated in the ad. The voice-over appealed to Baby Boomers by emphasizing the quality of the TV’s picture by explaining it has “over a billion color combinations” that make it the “clearest, most vivid picture” Samsung has ever made. 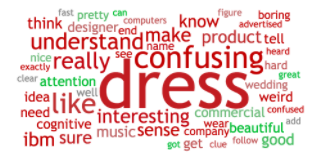 Of this age group, 68% responded they were more/much more likely to purchase the product after watching this. In their verbatims, they noted how the ‘beautiful,’ ‘colorful’ visuals demonstrated the TV’s ‘high quality’ and made them want the product. Delivering clear and detailed information makes Baby Boomers more receptive to long form ads than younger viewers, whose attention span is accustomed to 6-second “bumper” ads, or none at all. The average length of the top 20 Boomer ads is :59, compared to :45 among the top 20 ads for Millennials. Baby Boomers value the additional information more than the length of an ad. In “Reducing Crime in Ring Neighborhoods,” Ring.com used a long form ad to address a relevant issue — crime. The 1:45 spot presents real statistics and facts, as well as demonstrates product capabilities to show how the product helped lower the crime rates in an LA neighborhood. Keeping their family and neighborhoods safe is highly appealing to this demographic. This ad was able to touch on that feeling, while also providing significant product details. Perhaps the most prominent theme among bottom ads is message confusion. Many of the ads place little emphasis on the product and instead focus on bold creative elements, like bright visuals and loud music, and/or character development. This strategy overwhelms and frustrates Baby Boomers. The ads with a lot of clutter and confusion led to 41% of Baby Boomers selecting ‘None’ as the Single Best Thing for the ads in the bottom 20. Among the bottom 20 ads, 45% used humor that was a turnoff for older viewers, who scored Desire the lowest among these ads. Humor is especially risky if it doesn’t relate directly to the product, which contributes to the confusion mentioned above. When the humor incorporates younger characters, Baby Boomers find the creative ‘annoying,’ ‘childish,’ and ‘insulting’ to their intelligence. We’re not saying avoid comical elements at all costs. Baby Boomers still appreciate humor when an ad is relatable, heartwarming, or communicates product information. Ford’s “Go Further” ad, below, is a great example of using humor that engages Baby Boomers. The spot portrayed funny everyday life situations this demographic found very ‘Relatable’ and ‘Attention Grabbing’ while still being Informative. Solely focusing on getting a laugh out of this audience won’t pay off if the ad causes confusion. Note: Avoid political undertones when targeting Boomers. Social stance ads have the same effect as humor. Baby Boomers think advertising should not mix with politics, even if they agree with the brand’s stance on an issue. As for brand loyalty, many assume Baby Boomers are set in their ways and aren’t looking to swap their favorite product for its competitor. As children of those who were influenced by the Great Depression and world wars, they look for the best value, which doesn’t guarantee loyalty, whereas Millennials see brands as an extension of their personal identity. One study found that Millennials had roughly the same level of brand loyalty as their parents. Furthermore, advertisers can persuade older demographics to adopt new trends and technology, as shown by the 60.7% of Baby Boomers who own smartphones, with penetration at 73% among the younger half of the generation (age 50 – 59). On top of that, social media gained momentum among older demographics, with the largest preference for Facebook coming from the 73% of Baby Boomers on social networks. Keep in mind, generational segmentation and targeting will be counterproductive if brands don’t drill down further into a more focused Boomer audience. Not all Baby Boomers are the same. There are clear differences in consumer behaviors between the younger and older halves of the generation. On top of that, not everyone in this demographic is well off financially — 24% of them have nothing saved for retirement. Combine that with increased life expectancy, and some Baby Boomers have more time to live on less than the generations before them. Therefore, if you’re trying to resonate with the frugal market of Boomers, focus on deals and discounts, as opposed to brand equity, when communicating value information. Make sure you get the most out of your Baby Boomer creative efforts by targeting the right segment with advertising techniques that best suit their preferences. Looking to resonate with the Boomer generation? An emotional pull or clear product information fuel an ad’s Relevance, Desire, and Likeability among this group. Flashy visuals and music are not appealing to them, and will hurt an ad’s effectiveness if those elements detract from the message.